Above : Lawn-Boy 17732 vs. Greenworks 25022 vs. Snapper 1687884. Electric vs Gas lawn mower : What are the advantages and disadvantages of each type? In this article we explain the differences between gas, battery-powered and corded-electric lawn mowers. Which type of mower is the best choice for your needs? There is so much to look forward to as summer approaches. Mowing the lawn may not be one the great pleasures of summertime, but it is something none of us can avoid. So, it’s always around this time of year that many folks are thinking about buying a new lawn mower. This always raises the question : Which is better, a gas or electric lawn mower? Truthfully, there can be no precise answer when considering electric vs gas lawn mowers. To complicate matters even further, choosing an electric mower has become less simple. Battery-powered lawnmowers have really improved over the last few years. So it’s no longer a simple question of electric vs gas lawnmowers. Now it’s a case of corded electric vs cordless vs gas lawn mowers. Phew! Technology is great, but it does add to our choices and that makes the decision all the more complicated. When setting out to buy a lawn mower, it’s not just about electric vs gas. What size lawnmower do you need? Then there’s all the extra functions like mulching attachments, self-propulsion and the like. There is certainly a lot to of factors that go into choosing the best lawn mower. This article is going to offer all the lawn mower advice that you could possibly need. Perhaps more. Because lawnmowers are quite complex and there is lot get through, I’m going to stick to walk behind mowers. If we were to include ride on lawn mowers, this would end up being an epic tale. So we’ll talk about ride on lawn mowers at another time. There’s a lot to get through, so it’s best we get started. Since the main question here is in regard to electric vs gas lawn mowers, this seems like the appropriate place to start. I’ll be approaching this question by discussing gas mowers, corded electric and then cordless electric lawnmowers. For each type of lawnmower, I’ll mention the pros and cons of each type. I’ll also talk about what to look for with regards to each type of lawnmower. For a very long time gas lawnmowers have been seen as the real deal, especially for larger yards and commercial landscapers. When the only electric mowers were corded models, gas was the only lawnmower that could handle lawns that were too large for the length of an extension cord. Though there’s more to it than just the working range. Gas lawn mowers are generally more powerful. So this means that gas lawnmowers can have larger blades that make mowing the lawn much quicker. For a small yard this might not be too important. In fact, a large lawnmower isn’t always the best if your yard has a lot of narrow spaces between beds. For the most part, we can say a gas lawn mower would be the number one choice for cutting large lawns. Though a gas lawnmower does have its cons. The biggest annoyance of a gas mower, for many, would be the noise. The bigger the engine, the more noise you have to contend with. In neighborhoods with noise level restrictions, it may even be impossible to use a gas mower. The engine could be too loud to meet local regulations for noise pollution. This is something you’d have check up on, before buying a gas mower. The price is another big factor. In general, gas lawnmowers are the most expensive. Though battery-powered mowers aren’t cheap, but more about that later. Apart from the purchase price, there are other costs involved when using a gas lawnmower. The most obvious of these would be the price of gas. Generally, gas lawnmowers use a 2-stroke engine, so you also have buy 2-stroke oil. These lawnmowers require the most maintenance, so this is another cost you need to consider. When it comes to pure ease of use, gas lawnmowers don’t fare too well either. You need to mix oil with gas and check that you have enough fuel. Sometimes, starting a gas lawnmower can be a little problematic. Though with the correct maintenance, you can avoid a lot of this inconvenience. None the less, you could end up pulling on the recoil starter several times before the engines fire up. This is more of an issue in really cold weather. Though, especially as the lawn mower gets older, carbon on the spark plug or a dirty carburetor can make a gas lawnmower impossible to start. In these cases you need to know a bit about engines, in order to rectify the situation. Gas mowers emit fumes, are noisy and require maintenance. Gas (combustion) engines always have fairly toxic, foul smelling emissions. Even with strict EPA regulations, there is no such thing as an emission-free gas engines. Since lawnmowers use 2-stroke engines, emissions are higher and become worse as the lawnmower gets older. Despite these shortcomings, there are plenty of people who feel the advantages of owning a gas lawn mower outweigh the disadvantages. In time, we get used to the mechanical issues and can quickly remove and clean a spark plug or clean the carburetor. ✓ If you care about the environment then you need to read this article : American Lawn Care Emissions. How sustainable are gas mowers? What’s the cost to the environment? Do you care how much your yard tools pollute? Later in the article, I’ll provide more advice on lawnmowers in general. For now, I’m going to concentrate on matters specific to gas mowers. Engine size is an obvious deciding factor. A larger engine won’t have to work as hard as a smaller one. It will provide enough power at a lower RPM, which reduces engine wear. Weight can also be a deciding factor, when considering the engine size. A gas lawn mower is already heavier than any other. As the engine size increases, so does the weight and this may be problematic for some. If your grass gets quite long before you cut it, a larger engine will certainly help. I’d also recommend that, if your lawn mower has to work for longer time periods, or on a daily basis, a large engine will be beneficial. Some people find a recoil starter to be a tough item to use. This becomes harder with large engines that have heavier pistons under compression. Many gas lawnmowers now have easy start functions. This is usually a decompression device that reduces the engine resistance, making it easier to tug on starter rope. Mowers with electronic assistance for the carburetor and electronic ignition will usually be easier to start and will always be more reliable. Maintaining your gas lawnmower is a very important part of owning one. As a rule, I’d say you should have your lawn mower serviced regularly by a certified dealership or service agent. Many DIY homeowners will do this themselves. But this will nullify the warranty on a new mower. Even if you have your lawn mower serviced by a professional, there quite a few things that you should do on an ongoing basis. Before you start your lawnmower, remove the air filter and clean it. Do this every time you use the mower. It doesn’t take long to do, and will improve its reliability. Always mix the fuel and oil to the correct ratio. Too much oil will result in excessive carbon being produced. The lawnmower will belch noxious smoke and the carbon will damage the carburetor and engine. Too little oil will result in overheating, causing irreparable, long term damage to the engine. Always use fresh fuel. Modern, ethanol based gas is said to deteriorate within a month. Though this is very much a ballpark figure, so using the gas within a month is playing it safe. For the most part, you can probably get away with three months. But this can be pushing the limits, you never know how long the gas has stood for before you bought it. If your lawnmower is going to stand unused for longer than three months, drain the carburetor of fuel. The easiest way to do this is to run the engine, with fuel tap closed, until the engine dies from fuel starvation. Fuel left in carburetor for extended periods will form a sticky residue that will block the carburetor. This will usually prevent the lawn mower from starting or running properly and will require the carburetor to be cleaned before using it. If you don’t want to get dirty and do regular maintenance on your lawn mower then you should not buy a gas-powered model. Instead, get a powerful battery-powered mower. As these are usually the cheapest type of lawnmower to buy, they are very popular. Power can be limited but, for most lawns, an electric mower has what it takes to get the job done. Long thick grass, or a lawn with a lot of moisture could place unnecessary stress on the electric motor. So a corded electric lawnmower will always be lighter duty machine. They are typically used in yards no more than ¼ acre. Though I doubt many people would want to use an electric mower for this size yard. It’s not just the lower power that restricts the yard size for which you can use a corded electric lawn mower. An extension cord can’t be too long. Motor sizes vary, a more powerful electric mower will need a lower gauge (thicker) extension cord. The longer an extension cord is, the thicker the wire needs to be. So there’s a limit to the length of the cord that you can use for a lawnmower. The cord can also be a nuisance. Not only do you have to be constantly aware of the cord, making sure you don’t get it caught up in the blades, but the cord can snag on plants and other obstacles in your yard. For a smaller yard, the advantages of using an electric lawnmower goes beyond just the purchase price. This makes them very worthwhile, albeit with some limitations. An electric lawnmower doesn’t need much maintenance. Apart from occasionally replacing the brushes on the motor, they should work perfectly with nothing more than some basic checks and cleaning. The details of which, I’ll be discussing when we talk about general lawnmower maintenance. Electric lawnmowers are not entirely quiet, but are much less noisy than gas machines. They are easy to start. You just plug it into an electric socket and pull on the trigger switch to get going. There are no gas emissions to deal with, nor do you have to worry about mixing gas and oil. Although electric lawnmowers will never be as big and powerful as the biggest gas-powered models, they do vary in size. The biggest electric lawn mowers will have a larger blade. This will be beneficial in saving time, particularly for a large yard. Though a larger electric lawn mower will cost more and will use quite a bit more electricity. In general, corded electric mowers will have a noticeable impact on your electricity bill. So this is something to be aware of. Other than the size, there isn’t too much else to consider. Later, I’ll provide a more general lawnmower buying guide that will take a more detailed look into the features and functions that may be important, regardless of whether it’s an electric or gas lawn mower. Using an electric lawnmower doesn’t require much effort or skill. You should always check that all electric cords are in good condition and never use an electric lawn mower in wet weather or on a wet lawn. Moisture and electricity is a dangerous combination and wet grass is heavier than dry grass. So mowing wet grass, with a less powerful electric lawnmower, can damage the motor. Like so many, I’m a huge fan of cordless tools. 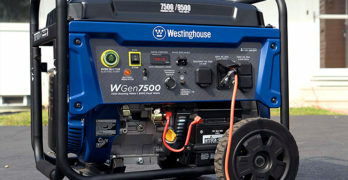 Battery technology has changed the way we look at powering anything from a small drill, all the way up to large lawnmowers. Recent developments in battery-powered equipment has seen voltages increase, which has improved the working time that we get from the battery. Many of the best cordless lawnmowers can hold their own when compared to gas-powered models. By using brushless DC electric motors, cordless lawnmowers are incredibly efficient. They are the most economical lawnmowers to use. All of the larger battery-powered lawnmowers can rival, even outperform, corded electric equivalents. So you generally get better power from a cordless electric mower and it will use way less electricity. So when considering the extra money that you’re paying for a cordless lawnmower, you need to keep in mind that you will be saving quite a substantial amount on your electricity bills. Not only are brushless DC motors very efficient, but they also have computer technology to maximize the energy used with regard to the power needed. This further improves their efficiency. Then there’s the obvious advantage of no extension cord to bother about. This means that you can work any distance from a power outlet and you don’t have all the safety issues to worry about. Low voltage DC power is completely safe. The brushless DC motor is quieter than AC motors used for corded electric lawnmowers, making battery-powered mowers the quietest of all. The biggest difference when buying a battery-powered lawnmower is quite obvious. You need to pay attention the battery. There are two specifications that are important to batteries: Voltage (V) and Ampere-Hours (AH). These two figures work hand in hand. There’s a misconception that a higher voltage makes for a more powerful lawnmower. The reality is that you can draw as much power as is needed, regardless of the battery voltage. A 20V battery can deliver the same wattage as an 80V battery. The only difference is that the lower voltage battery will have higher amps. Using a lower amperage will have a minor impact on efficiency. So the higher voltage lawnmower will provide a little more working time (relative to the AH) than a lower voltage battery. To simplify things, we really need to look at the ratio between Ampere-Hours and Voltage. A 4AH 20V battery will provide roughly the same working time as a 2AH 40V battery. You may score a minute or two from the higher voltage battery, because of improved efficiency, but this will be negligible. Essentially, when we look at a 4AH 20V battery vs 2AH 40V, you’ll notice that the 40V battery has twice the voltage and half the Ampere-Hours. So the ratio becomes equal. If we were to compare a 4AH 40V battery to a 4AH 20V battery, you can expect double the working time from the 40V battery. There Ampere hours are the same, but the 20V battery has half the voltage. Hence, half the working time. In the end, the highest voltage with the best Ah spec, will provide the longest working time from the battery. You will always see lawnmower manufacturers advertise a working time of “up to” a certain amount of minutes. This is seldom the case, they are obviously trying portray their product in the best light. Battery working time will be affected, to quite a large degree, by the ambient temperature. A battery will discharge faster in hot weather. So when lawnmower manufacturers calculate the working time for a battery, they do so under perfect conditions. This will be at a low temperature at the lowest power setting. Most battery-powered lawnmowers constantly monitor the power requirement, using an onboard computer. It will reduce the power drained from the battery when the motor doesn’t need to labor as much and automatically increase the power for longer or thicker grass. So their estimated power usage, would be for the lowest power consumption. So, if you’re cutting long grass in hot weather, you might get around half the specified working time. I always advise buying more than one battery. Having extra batteries allows you virtually unlimited working time, depending on how many you use. While using one battery, the others can be charged and used later. It is also advisable to buy all your tools from the same brand, using the same battery. Some manufacturers may use several types of battery. So it’s important to check that all your tools use the same voltage battery. I say this because, you can use the same battery for all your tools. This saves a lot of money and hassle. The battery charger is another thing to consider. The best charger is a rapid charger with cooling and over-charge protection. Rapid charging means that the battery will charge faster, so you have a spare battery ready for use much sooner, reducing downtime. Cooling is really important, especially with a rapid charger. Batteries generate a lot of heat when charging and heat is no good for batteries. The battery heat is the most important consideration when it comes to correct usage of your cordless lawnmower. There is basically no maintenance needed for these machines, other than correctly charging your battery. Lithium Ion batteries can be stored for prolonged periods, even at low charge, without sustaining any damage. Though it’s better not to store batteries when they are less than 30% charged. Even then, it’s advisable to place the battery on charge roughly every three months. Always charge your batteries in a cool environment. Even if the battery charger has internal cooling, this will be more effective if it is not in a hot room. Once the battery has reached full charge, remove it from the charger as there will always some excess heat generated by the charger. The golden rule for batteries is to always keep them cool. Proper battery management can double their usable lifespan, saving a fortune over time. Generally, one can expect at least 2-years lifetime for a battery. Though, depending on how often you use the battery, and how you look after them, I’ve had some batteries last up to 4-years. Your working time will be reduced over time, but you can still get a reasonable amount of time from a battery that is a few years old. Apart from electric vs gas, there are other specs that can be common to all lawnmowers. This could be anything from the size of the lawnmower to its additional capabilities. What Size Lawnmower do you need? The size of your lawnmower, relative to the size of your yard, is mostly about how hard you’re prepared to work vs how much you want to spend on a lawnmower. Smaller electric lawnmowers are obviously for a smaller yard. A ¼ acre is fairly large for a residential neighborhood. This is about the limit for a walk behind mower with a large deck (22” – 24”). For yards larger than this, you will probably want to consider a ride on lawnmower. If you yard has hills, or any type of gradient, self-propulsion will make a big difference. These mowers use power from the engine (or electric motor) to drive the wheels, making it easier to negotiate any type of incline. Self-propulsion can also be an advantage when pushing a lawnmower with a large bag that will become heavy. There are three types of self-propelled walking lawn mowers. Front-wheel drive can help you use a heavy lawnmower on flat ground with numerous obstacles. To steer the lawnmower in tight spaces, you simply have to push down on the handle, thereby reducing the traction of the front wheels. Rear-wheel drive provides a good deal of assistance for uphill, or side hill mowing. All-wheel drive is the best for steep gradients, mowing up or downhill. They also provide the best traction for side hill mowing and uneven (washboard) lawns. The method of propulsion can differ. The most expensive self-propelled lawnmowers are called Hydrostatic. This uses hydraulic power to drive the wheels. It is the smoothest action, with the best speed control. These are also the most reliable self-propulsion systems, but are the most expensive. Cheaper front and rear-wheel drive mowers will usually use belts and pulleys driving the wheels through a gearbox. These systems require a fair deal of maintenance and aren’t quite as smooth as hydrostatic transmission. Lawn Mower : How Many Functions? Two function lawnmowers mulch and bag the lawn cuttings. A shredder is used to cut the lawn clippings into small pieces, ready for mulching, before discharging them into the bag. Three function lawnmowers offer the option for mulching and bagging or a side discharge through a chute. The wheels on a lawnmower can make a big difference. Larger rear wheels will make life much easier. The front wheels are usually smaller as it’s the rear wheels that do the work. Caster front wheels are helpful when turning the lawnmower. Wheels that use ball bearings instead of bushes don’t require as much effort to push. Height adjustment allows you to control how close your blade is to the ground. This is usually done using a lever with preset height adjustments. Deck cleaning attachments are great for easy maintenance. These lawnmowers have a fitting for a hosepipe. This means that you can hook up a hosepipe to clean the mowing deck. Upright, or vertical storage means that the mower has a base that allows it to be stored in an upright position. This is great when storage space for your lawnmower is limited. We’ve already looked at maintenance that is specific to a particular type of lawnmower. Now we’ll look at basic maintenance that is required for all lawnmowers. After mowing the lawn, you should clean the cutting deck before storing. The underside of the deck (around the blade) gets covered in fine lawn cuttings. This should be cleaned using a hard brush and water. If your lawnmower has a hose cleaning attachment, you only need to attach the hose and turn the water on. The rest is done for you. At least once a year, check the general condition of your lawnmower. Check that all fuel pipes and electric wires are in good, safe condition. Check that all the nuts and bolts are correctly fastened. Damaged paintwork will lead to rust. Any exposed metal surface should be cleaned with a metal brush to remove dirt and rust. Apply fresh paint or a rust inhibitor to exposed metal. Bearings, shafts, and levers need to be greased at least once every year.